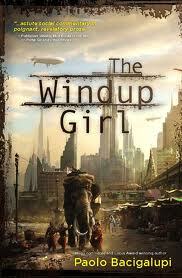 So I looked forward to it as I do enjoy a good future dystopian fiction – and the best part is I wasn’t disappointed! Set in Thailand circa 2300, the world has become a different place what with the environmental crisis and it now depends on “springs” for energy and “seed corporations” for food. Outlaw gangs and corporations use a variety of techniques to control the markets. Thailand is in serious trouble. Emiko is a genetically produced slave girl made in Japan and brought into Thailand where she was abandoned. This makes her illegal in Thailand and she is forced to turn to prostitution and treated abysmally. But Emiko has some very valuable information. She meets Anderson Lake who gains this information via coercion and tells her there is a “safe” zone of “new people” in the north. There are really quite a lot of characters and their roles become confusing – I had to use a cheat-sheet. But the high-intensity action is very well written and fast-paced – it kept me glued into the wee hours! Davis does a wonderful job on narration – never overdramatic, never boring.